CHARLES PAYNE (HOST): Again, corroboration by Comey that indeed he told Trump more than once, on three occasions, that he was not the center of an investigation. I guess it might get back to the situation with Michael Flynn and how you parse these words: “I hope you can see your way clear to letting this go.” How do you see it? 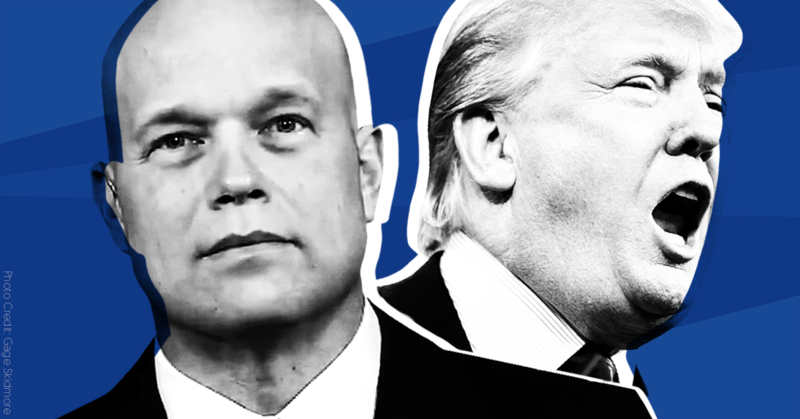 Whitaker defended Trump firing Comey for the handling of the Clinton email investigation. STUART VARNEY (HOST): You know Comey, you like Comey, but you say President Trump was right to fire him. Make your case. WHITAKER: Well my case is pretty simple. When I came into the Department of Justice, Jim Comey was the deputy attorney general, and he orientated me to the Department of Justice, and over the years that we served together, I would interact with him on a regular basis. I know him well. And what I do know though is if you read Rod Rosenstein’s memo that outlined the basis for firing Jim, that he was accurate, that Rod’s case talks about how he took, how Director Comey at the time took the Hillary Clinton email server situation and made it not just a denial of prosecution, but made it kind of a little bit of a political circus, and ultimately did things inconsistent with not only FBI policies but also FBI traditions. VARNEY: The criticism of James Comey is that he went public and politicized the FBI and put the FBI into the middle of political debate and that’s something you really should not do. Is that in a nutshell, that’s the criticism? CHRIS CUOMO (HOST):The big push back that we keep hearing Matthew, while premature at this point of investigation is none of this is a crime. Nothing that you guys are talking about is a crime. There's no proof there's any criminal transactions of a financial nature, even if the President had a heavy hand in drafting and arguably misleading statement about the Don Trump Jr. meeting. Not a crime. 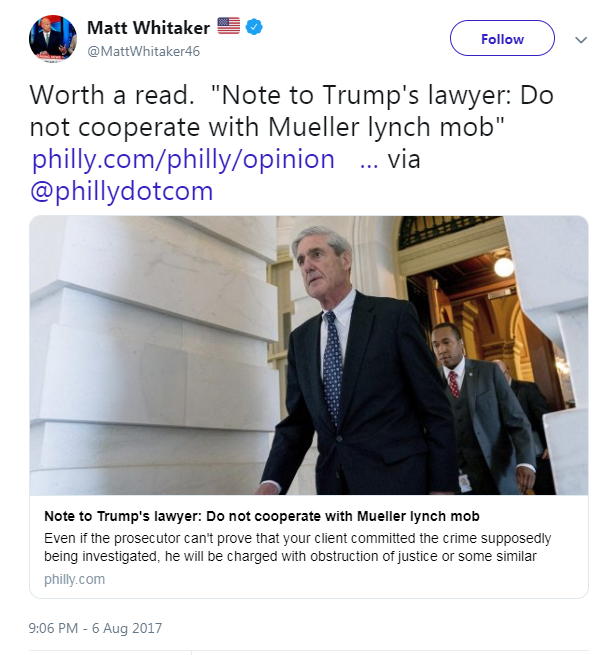 WHITAKER: Right. I think one of the developments today is the fact it's been leaked that grand jury subpoenas have been issued from the grand jury. But we still haven't had any evidence or proof of any crime and I guess I would like the go to the one point that needs to be made here and that is if Bob Mueller and his small U.S. Attorney's office does go beyond the 2016 election and get into Trump organization finances unrelated to the 2016 election and really unrelated to Russian coordination, if it exists. I think that would be crossing a red line. I think that is when the deputy Attorney General, the acting Attorney General for the purpose of this investigation Rod Rosenstein, who I served with in the Bush administration, he needs to step in and pull the reigns (sic) back on Bob Mueller if he starts to go outside of the bounds of his delegation of authority. CUOMO: Gentleman for a moment, just for the audience that didn't have the insanity to go to law school. Just because you hear scary words like grand jury and subpoena, the process should not be mistaken for the productivity. We don't know what will come from the requests for information and testimony. We'll have to see. I understand the special counsel has criminal jurisdiction here. But there is a parallel, at least co concern of a political nature and you mentioned earlier Matthew, Rosenstein may have to step in and pull back the reins if Mueller goes too far. But imagine if that were happen. Imagine if the president word to make good on his threat, a hyperbolic as it may have been intended, don't go after my money. That is too far, and then what would happen in this situation? Not legally but the optics and the politics and the realities of Rosenstein saying to Mueller stop doing that or the President saying Mueller's gone too far, step in. What would that mean? WHITAKER: As a former U.S. attorney, we did conspiracies all the time and prosecute conspiracies. I mean what happen here is this lawyer used a pretext to get a meeting with, you know, some important campaign officials to really talk about the issue she wanted to talk which is getting rid of this U.S. policy regarding adoptions and used, you know, quite frankly here in Iowa we can call it a B.S. excuse of saying that she had opposition research. And listen nobody's talking about what that opposition research is because we all agree it's ludicrous. I mean that the fact that Russians are funding the DNC and, you know, helping Hillary Clinton. No one's advancing that. And Don Jr. when he heard that certainly dismissed it quickly as base on what he said. And I think, you know, sort of to suggest that there's a conspiracy here. I mean you would always take meeting. You would have somebody from your campaign take the meeting to try to get the information. Mueller has come up to a red line in the Russia 2016 election-meddling investigation that he is dangerously close to crossing. It does not take a lawyer or even a former federal prosecutor like myself to conclude that investigating Donald Trump's finances or his family's finances falls completely outside of the realm of his 2016 campaign and allegations that the campaign coordinated with the Russian government or anyone else. That goes beyond the scope of the appointment of the special counsel. It is time for Rosenstein, who is the acting attorney general for the purposes of this investigation, to order Mueller to limit the scope of his investigation to the four corners of the order appointing him special counsel. KATE BOLDUAN (HOST): Matthew, the deputy attorney general says they are not going on any fishing expedition, but you think they are. Why? WHITAKER: Well, I was concerned when I read the CNN reporting, which you mentioned, that they were looking -- that the special counsel is looking at Trump's finances, unrelated to the 2016 election, unrelated to Russian coordination in that regard. I think that is a red line that is beyond the scope of the letter that the deputy attorney general issued and appointed Director Mueller as special counsel. Really, it's not controversial. It would be a fishing expedition if they start looking into essentially all of Trump's finances. I know that's what some on the left want. There is a Fourth Amendment issue, even as it relates to the president and others in his family. We cannot have unfettered prosecutors turning over every rock unrelated to any nexus to the underlying issues, which is the Russian coordination and the 2016 election. BOLDUAN: Started with a land deal gone bad, and ended up with Monica Lewinsky. WHITAKER: Yes. There are two differences. One, it wasn't independent counsel under a different law. But also Ken Starr went back and sought, expanded jurisdiction, as Michael's describing, so he could go after other things unrelated to the initial investigation, which was the Whitewater land deal. So, I think there are key distinctions there.